It never fails. No sooner have I written up my favorite games of the year, than I play one that would have undoubtedly earned a spot had I just gotten to it a little faster. 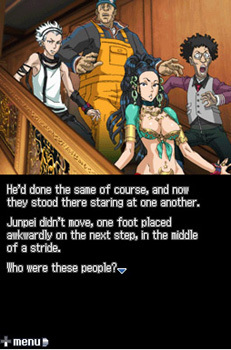 9 Hours 9 Persons 9 Doors (999), with its unusual combination of elements from sources as diverse as And Then There Were None, survival horror, and puzzle games like Professor Layton, is one of those games. You wake up in what appears to be the third-class cabin of a luxury ocean liner. You have little time to ponder the large red number 5 spray painted on the door, or the card-reader lock beside it before the porthole breaks and the room begins to flood. This is your rather dramatic introduction to 999's "Escape" segments, in which the object is simply to get the hell out of the room. Although the scenario might seem dire, you're never in any actual rush; you can take as long as you need to examine the room and its contents in order to solve the puzzles before you. The puzzles are a mixed bag of brain teasers like magic squares and codes, and more typical adventure game fare, with environmental puzzles that rely on objects from your inventory. Thankfully, each area's puzzles are self-contained, so you won't be bothered lugging random bits of junk all over the ship wondering what you're meant to be doing with them. Everything you need to get past your current obstacle is there in front of you, so long as you can figure it out. After you've managed to make it past a puzzle and out of a given room, you'll typically encounter one of 999's "Novel" segments, which deliver the plot and require a great deal of reading. You quickly learn that you are but one of nine guests - each sporting a bracelet with a number from 1 to 9 - invited (against your will) to play the "Nonary Game." The object is simple: You have nine hours to get off the ship before it sinks by making your way to the door with the great big 9 on it. Because of the rules of the game, only a few people can go through any one of the ship's numbered doors at once; break that rule, and the explosive that your host placed in your chest will splatter you across the wall. The companions you choose will determine not only the parts of the story you learn, but also which one of the game's six endings you discover. This is, unfortunately, where 999 will probably lose a fair number of players; you'll spend much of your time with the game doing nothing but tapping the touch screen to advance the story. A lot of it also won't make a great deal of sense until you've played through the game several times, a prospect that loses a lot of its appeal once you realize that the puzzles don't change. The challenge will be gone, but you'll still have to go through the busywork of solving them in order to move through the rooms and on to the next bit of story. 999 at least recognizes that reading through the same chunks of story, like your introduction to your fellow passengers, over and over and over again would get many players to wondering just what would happen if you chucked a DS cartridge into a microwave, and wisely provides a handy shortcut. Pushing right on the D-pad will fast forward through any text you've already seen, stopping when you arrive at either a decision-making point, or new text. It's a great concession that makes it easy to whip through huge swaths of 999 so that you can test different choices and try to find your way to the one "true" ending. If only the game also came with a note function so that you could jot down the codes and puzzle answers as you find them; I wound up playing with paper and pen nearby so that I didn't have to waste brainpower redoing puzzles that I'd already figured out once. Because it involves so much reading, 999 moves at a somewhat slower pace than many games, but its grisly and mysterious subject matter make up for the lack of pulse-accelerating action. You won't die if you take a long time to figure out how to get the code out of the piece of frozen pork (no, really), but you just might die if you take the wrong person with you through a door. When observing tiny details make the difference between winning and receiving a knife in the back, reading long passages takes on a whole new kind of urgency. Bottom Line: If you're willing to put in the effort of replaying 999 to examine its many paths, you'll be rewarded with a multilayered, oftentimes horrifying, story and some satisfyingly creative puzzles. Recommendation: If you enjoyed other "visual novels," like Hotel Dusk, you're probably going to want to pick this up. If you're still unsure, give the demo a try. This review is based on the DS version of the game. Susan Arendt wants to know what's up with Lotus' outfit. I mean, seriously.